This salad is great for a hot summer day when you want something light and refreshing. 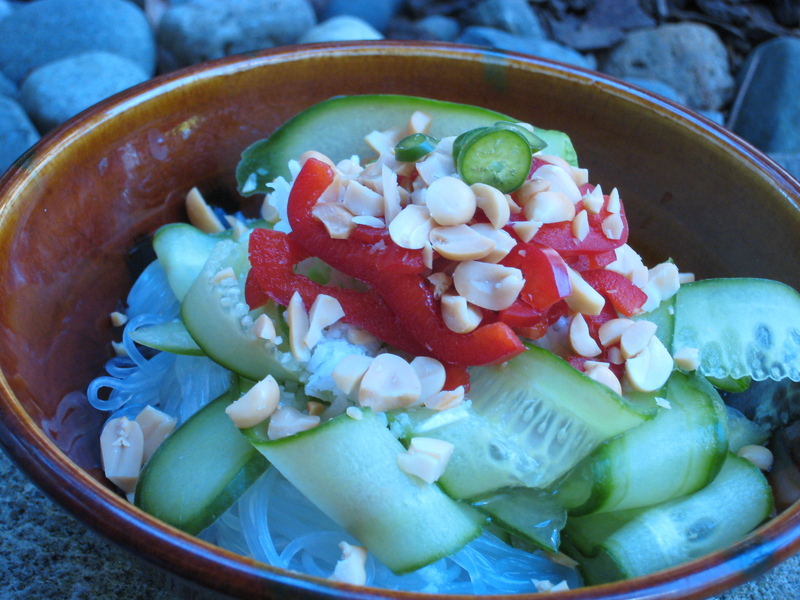 And a great way to use those cucumbers you’ve got coming up in the garden! 1. Put a pot of water on to boil. Use this to cook the rice noodles: after the water has boiled, take it off the heat and add the noodles. After a few minutes, when the noodles are al dente, strain them and pour cold water over to cool them. Set aside to continue cool. 2. Add one tablespoon of boiling water to the coconut, then stir in the brown sugar. 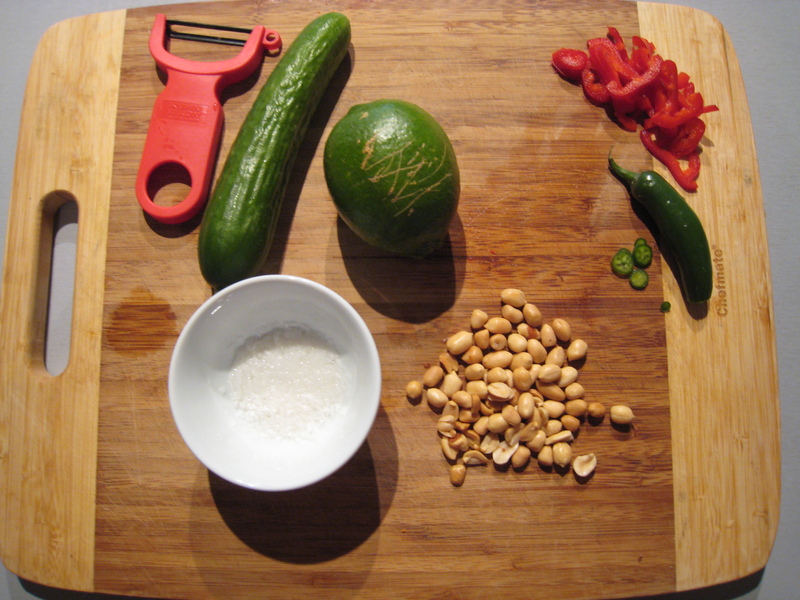 Leave this to cool, then add the lime, vinegar and soy sauce. Taste and adjust seasonings. 3. Toast peanuts in a frying pan, being careful not to burn them. When they are cool, chop them up. 4. 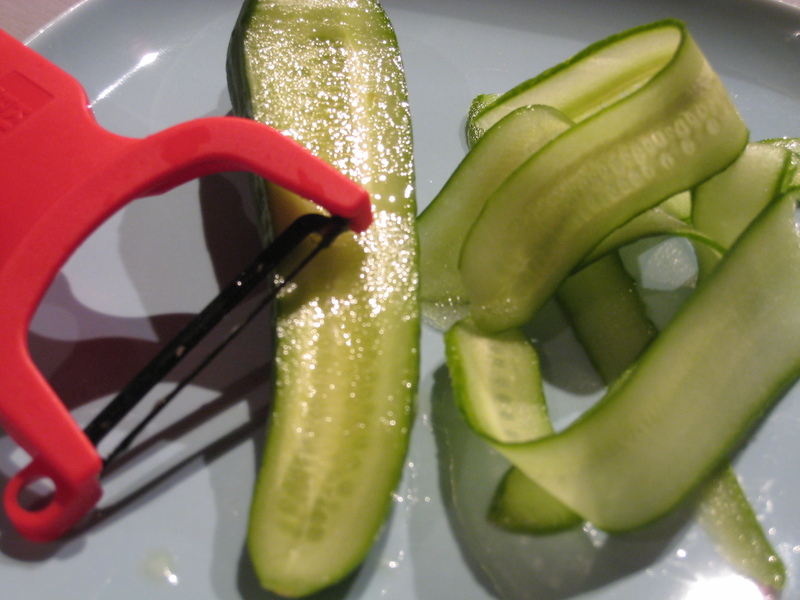 Chop peppers finely, and use a vegetable peeler to make long slices of cucumber. 5. To assemble the salad, first put down some noodles; make sure they have been well-drained. Place some slices of cucumber on top, then pour on the dressing. Add some sweet peppers, peanuts and hot peppers. 6. Enjoy your refreshing salad! Optional toppings include grated carrots, cilantro, tofu or some shaved beef, if you feel the need for some meat.